Regardless bug with failure checksum offloading was fixed in SNV_81 , i.e. a while ago. 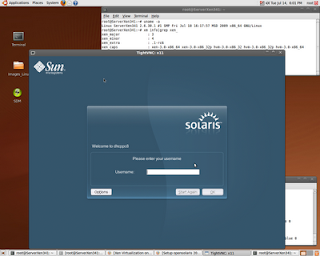 OpenSolaris 2009.06 PV DomU install at Xen 3.4.1 Linux Dom0 appears still to be affected. Wrong checksum may be easily captured via tcpdump on the LAN due to DHCPDISCOVER request issued by OSOL installer is a broadcast request. Following bellow procedure involves Solaris Kernel module debugger to patch OSOL’s (SNV_111b) kernel at booting up to succeed with dhcp lease and to be able to proceed with initial install, what appears to be critical point for some users. 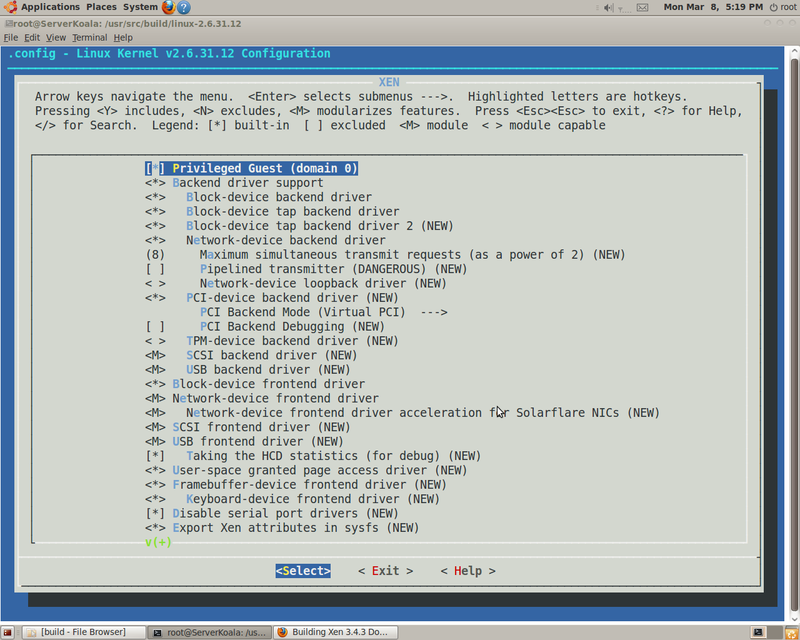 View Opensolaris domU unable to get dhcp lease. 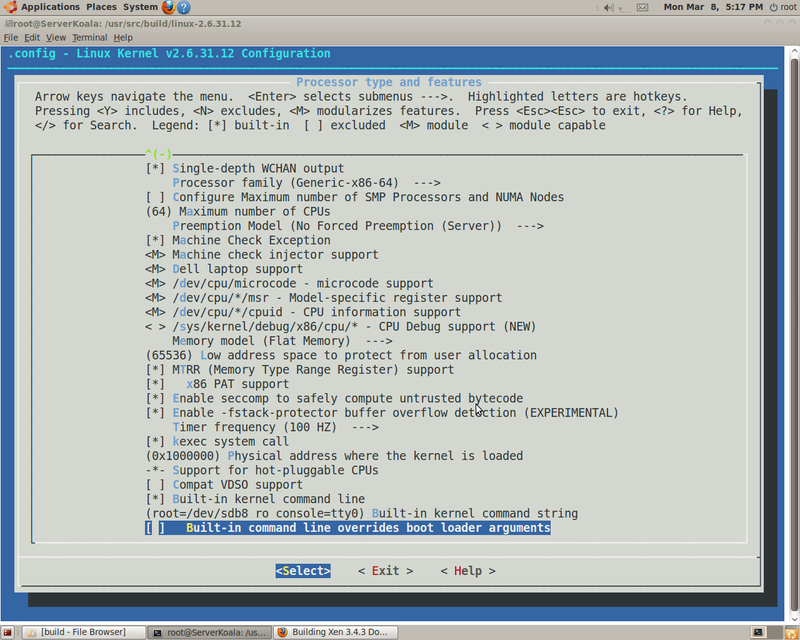 File /etc/system gets updated via root terminal session before standard reboot to make the patch for kernel permanent. Posting is devoted first of all to Linux users , who are not aware of “kmdb” syntax and it’s involvement into boot process. aborts with message cannot find kernel “/boot/platform/i86xpv/kernel/amd64/unix”. Setup bellow has been tested with 2.6.30.1 xenified (aka Suse) kernel and 2.6.31-rc1 pvops enabled kernel been built via rebase/master branch of Jeremy Fitzhardinge git repository. The root cause of the problem is ZFS v.16 utilized by SNV_117 DomU for it’s image device unsupported by Xen 3.4.1. Place “raw” content of CS 19889 into file /usr/src/zfs16.patch1. Modify corresponding Grub entry and reboot Xen Host. Install SNV_117 DomU via profile above. To be sure install would be OK use only primary partitions as image devices for SNV_117 DomU (ZFS based) or the first one in extended partion on x86 architecture. 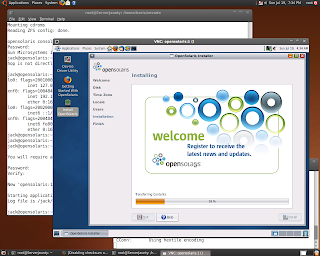 VNC Setup on SNV_117 DomU is the same as on OSOL 2009.06 DomU. Following bellow is build Xen Host on top Ubuntu 9.10 Server.It is based on direct clone via “hg” and build Xen 3.4.3-rc4 from xensource.com , applying Andrew Lyon’s 2.6.31 patch set V12 to vanilla kernel 2.6.31.12 along with tuning patched kernel via “make menuconfig” and building aka Suse xenified kernel in Ubuntu 9.10 environment.Notice that forward porting of original patch set was done by Jan Beulich for 2.6.31.8 kernel on OpenSuse 11.2. 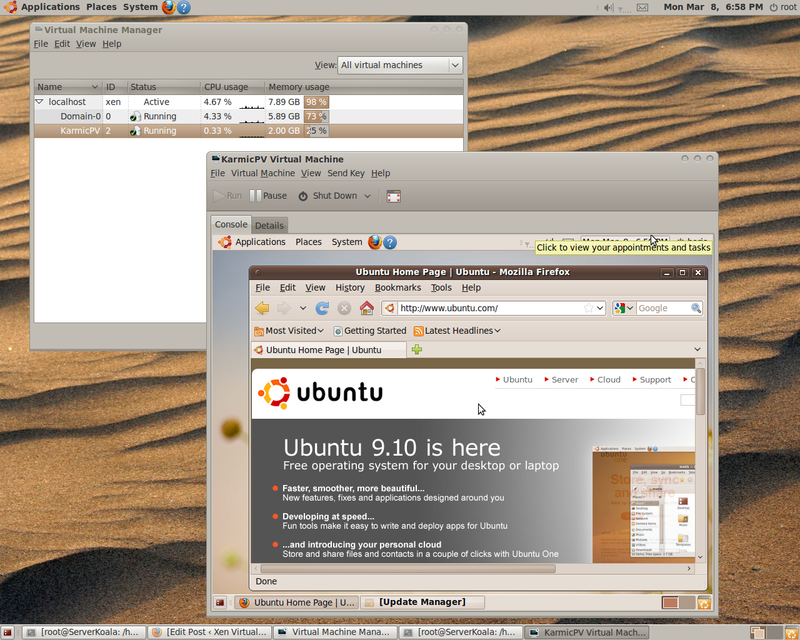 Built in patched kernel open-source NVIDIA and Radeon HD drivers work just fine on Ubuntu 9.10, providing Gnome Desktop Environment right away. 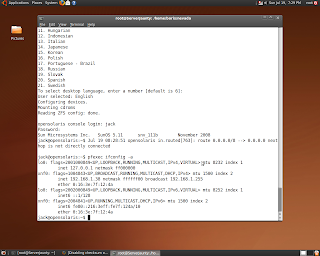 4.Untar linux-2.6.31.8.tar.bz2 and apply patches. “git clone”. 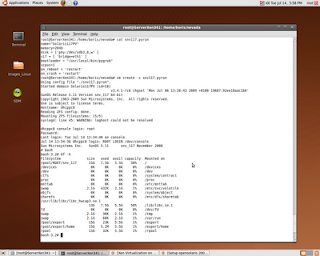 Difference in meantime is in “acpi” branch not merged yet to xen/stable. However, APIC rework has been committed for 2.6.32.9. 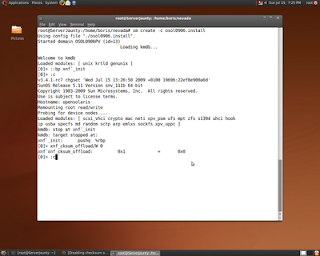 To test 2.6.31.12 xenified aka Suse kernel setup Xen 3.4.3 on to top of Ubuntu Karmic Server. 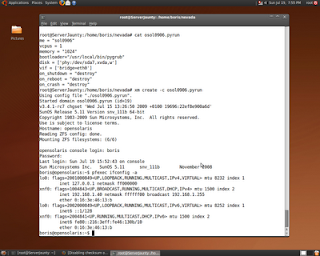 First – install on Ubuntu Karmic Server all packages required for Xen build along with Ubuntu-Desktop ( via tasksel). Of course, Xen Host doesn’t require GUI. 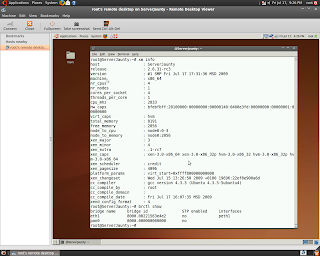 Install Ubuntu-Desktop just make work comfortable and faster. 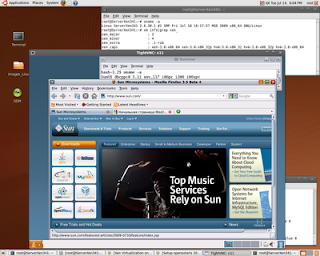 and rebooted into xen host.Tested OSOL 133 PV DomU,F12 PV DomU, Ubuntu Kamic HVM and PV DomUs sharing same image device. 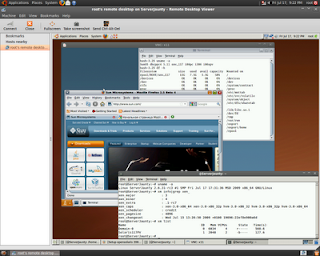 You are currently browsing the Xen Virtualization on Linux and Solaris blog archives for July, 2009.